For the different roles in game audio, an universal job definition and job title is often not existent. The participants in this study were asked to state what they think is their main job in regards to their main field of work. 77 participants are composers, 33 sound designers, 13 audio directors and five audio programmers. 10 participants named another main job which didn’t fit to the other job roles. For the analysis of questions where a differentiation between professions is relevant, the focus lies on composers, sound designers and audio directors in order to ensure decent validity. 51,4% of the participants are pure freelancers, 32,6% are employed at a company. With 46,7%, almost every second participant that is employed at a company also does additional freelance work. In terms of their working status, there are big differences between the professions. With 68,8%, composers work freelance far above the general average of participants (51,4%). Sound designers and audio directors are usually employed at a company, only 30,3% of the sound designers and 23,1% of the audio directors work as freelancers. 69,7% of the sound designers and 84,3% of the audio directors have an academic degree related to sound, but only 45,5% of the composers. An explanation could be that an academic degree is a required entry qualification to be employed as sound designer or audio director, while composers mainly work freelance which does not necessarily require an academic degree. 32,6% of the participants are employed at a company, and 30,8% of the participants work from their employers’ offices. 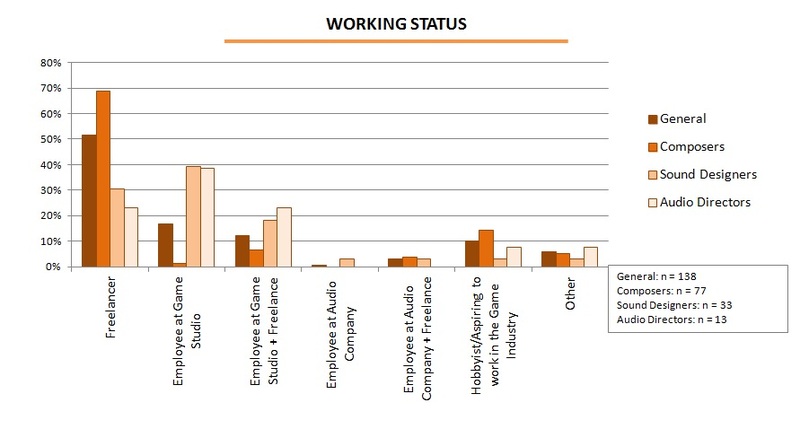 In conclusion, home office seems to be unusual for employed game audio professionals. 53,1% of the participants work from home, 16,2% work from a separate place. These should be mainly freelancers. It seems to be usual for freelancers to work from home and not from a neutral, separate place. The work of a composer includes composition as well as mixing and mastering. With 84,8%, the big majority does composition, mixing and mastering all by themselves. 12,5% outsource mastering to external service providers. Only 2,7% concentrate on composition only and let others do both mixing and mastering. For composers, Cubase (41,9%) and Logic (29,7%) are the most used digital audio work stations. Sound designers, on the other hand, use Reaper and Pro Tools (both 32,3%) most often. 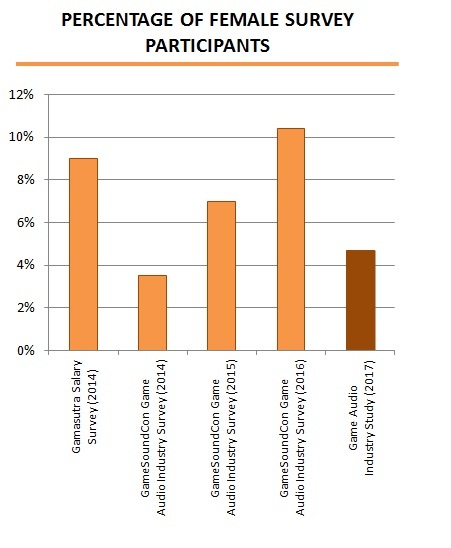 An important topic regarding the work and environment is the percentage of women in game audio. With only 4,7%, the number of women in the industry is very low – way lower than indicated in most other empiric studies. Unfortunately, because of the low number of female participants in this study, a comparison between men and women is difficult. This remains an important field of analysis for future research.